We are, we hope, near the end of a persistent wet season, during which I haven’t taken many photos. So, here is an attractive bird from the archives, photographed on a trip to Christmas Island in 2006, the Christmas Island Imperial Pigeon. It’s comparable in size (length 38-40cm/15-16in) to the Pied Imperial-Pigeon of northern Australia, but quite different in colour, much darker with strikingly iridescent plumage. In the first photo, the sunlight highlights the green iridescence of the back and wing feathers, while the second photo shows the purplish-grey and rufous-brown plumage of the underside. It’s endemic to Christmas Island, a mere speck – area 140 sq km – in the Indian Ocean 500 km south of Java. Because of its small range and therefore limited population, it is classified as Vulnerable on the IUCN Red List. It seemed to be quite common on the island and the population is thought to be stable, though there are concerns that it could be affected by an infestation of yellow crazy ants on Christmas Island. Control measures have reduced the ant infestation, but eliminating them has proved difficult and the baits used also affect other invertebrates such as the famous terrestrial red crabs. It’s closest relative is the Pink-headed Imperial-Pigeon (Ducula rosacea) which is widespread but rather rare in the islands of Indonesia and East Timor. It has suffered from both habitat destruction and hunting. Some authorities consider that the Christmas Island Imperial-Pigeon may be a race of the Pink-headed. I’ve added photos of three more Australian mammals to the website: the Euro (a blackish kangaroo), Bush Rat and Fawn-footed Melomys (also a rodent). The latter two obliged us with good view coming into feed on grain at Kingfisher Park over Easter, undeterred by the rain. 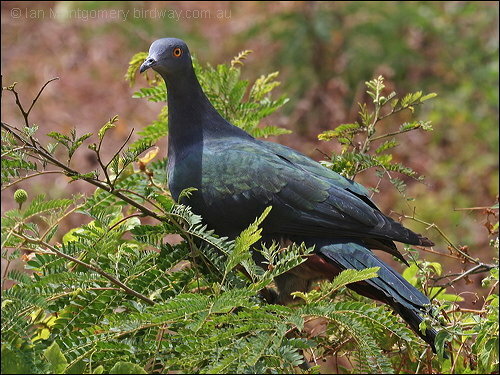 The Christmas Island Imperial-Pigeon has recently been changed to the Christmas Imperial Pigeon. It is in the Columbidae Family of the Columbiformes Order. There are 321 birds in the family of various Doves and Pigeons, plus Bronzewings and Bleeding Hearts. Check out the Doves and Pigeon page. Doves and Pigeons are mentioned many times in the Bible. 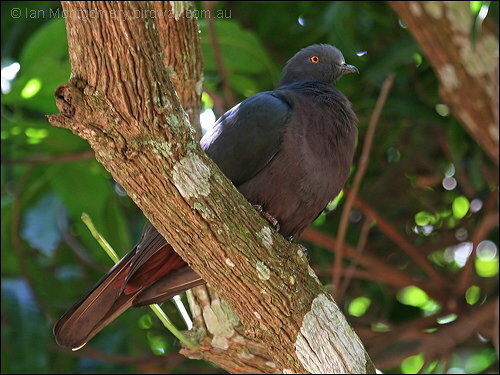 This entry was posted in Bird of the Week and tagged Birds, Birdwatching, Christmas Imperial Pigeon, Columbidae, Ducula, Ian Montgomery, Nature, Photography. Bookmark the permalink.